1.1. It's based on the Traditional Brush Stroke count, which generally we use the Kang Xi Dictionary as a guide for the stroke count. 2. Chinese Name is most effective when chosen for a Newborn Baby since the name will be with him / her for the rest of the life. 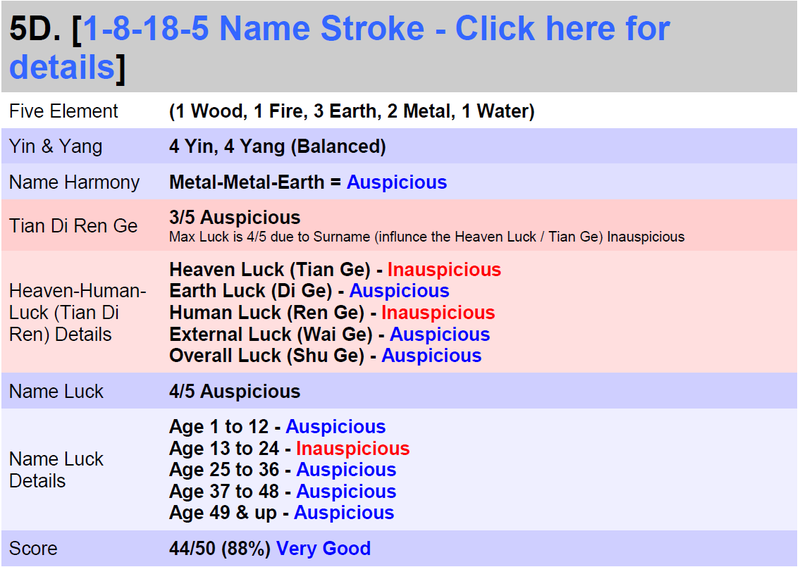 a) Heaven Luck - Luck you are born with and supposed to have from your given Ba Zi Heaven Luck. b) Earth Luck - Luck from the Feng Shui of your home and surrounding. c) Human Luck - Luck from your relationship with others and own hard work. 2.1. Each Heaven, Earth, Human luck affects about 33.3% of your overall luck. 2.2. Name luck accounts for about 15% of your Human luck, aside from the Colors/Shapes/Career/Directions etc. Hence, this is one and only few ways to help improve your Heaven Luck. As it will attempt to add the missing elements to your ba zi, through the Chinese name you use. As your name is being used throughout your life, so it will indirectly help add the necessary missing elements to the ba zi chart on a semi-permanent level. 2.3. Chinese Name for a baby is most effective, since the time he / she will use the name the most is when they attend school. They will write and use the name almost daily. Hence, the luck is being called and used. 3. Is there a need to Change my Name if it's not suitable? 3.1. I personally will only recommend a name change if for newborn baby or when he / she is still young (ie not yet an adult). 3.2. I won't recommend a name change for an adult unless it's absolutely necessary or if the Job requires it. For example, a name change for a person who is planning to be an Actor/Actress is still good as he/she depends on her name for recognition. 3.3. Otherwise, a name change at too late in life won't really be effective, as the most effective period where everyone is calling and using your name is when you are in school. After that, you are not likely to use it as much especially if you have a western name. So there is very little point in a name change at that point in time. More topics on will be posted into this blog later on.